Bovada is a premium online sportsbook for US residents and is known for being the most reputable site for the entire industry. They cater exclusively to American bettors and possess legitimate credentials for operating legally within the industry. Their current welcome bonus is a 50% match bonus up to $250 on your first deposit. They offer an extensive range of sports coverage, betting lines and wagering options, with odds that are comparable with the Vegas bookmakers. Their sportsbook includes advanced features such as live betting, live in play betting and mobile betting. They accept customers from most US states. Read our full review of Bovada Sportsbook for more in depth review of this brand. Is Bovada Sportsbook Legally Regulated? Yes. Bovada is a legally sanctioned brand and regulated by the Kahnawake Gaming Commission. 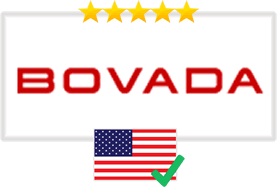 Bovada holds compliance certifications, including one for their RNG technology by iTech Labs that can be found on their site in the footer section. This sportsbook brand is permitted to accept US bettors and Americans are able to place bets with them due to their offshore status and legal sanctioning. Does Bovada Accept Players From All Of The United States? No. Bovada accepts players from 45 out of the 50 states. Players from Delaware, Maryland, New York, New Jersey and Nevada are not allowed to place wagers with Bovada sportsbook. After successfully creating an account with Bovada, you’ll have to deposit some funds into your account before being able to place a bet. When you do make that first deposit you are automatically eligible to claim your first sportsbook bonus. Bovada’s Sports Welcome Bonus grants you a 50% bonus up to $250. Your bonus will be added to your account after your deposit has been processed (in most cases, your bonus is available in 30 minutes). The Sports Welcome Bonus can only be redeemed on your first deposit and must be rolled over 5x before any withdrawals can be made. Bovada also has a Refer-A-Friend program where you can earn up to $40 USD of your friends’ deposit up to $100. This bonus can be claimed by sending your friend the designated referral link. Once they join and successfully make their first deposit, the funds will be added into your sportsbook account. The largest bonus available to Bovada users is their Bitcoin Welcome Bonus. This bonus is similar to their Welcome Bonus (both can be claimed), only that this one requires you to use Bitcoin as your deposit method. Bitcoin is one of the most popular online currencies on the market and is used frequently for online transactions. For their sportsbook, Bovada will give you a 50% bonus up to $500 on your first Bitcoin deposit. Bitcoin is one of two payout methods available with the site and the fastest way to receive your winnings, as if you needed any more incentive to try it out. Bovada has a long list of sports categories that are all available for betting. All of the major professional sports are there—football, basketball, baseball, soccer and hockey—but there are plenty more. You can bet on tennis matches, boxing/MMA fights, golf tournaments, horse races, NASCAR, cycling, darts, the Olympics, even eSports competitions. You can find betting lines associated with most major sporting tournaments like the World Cup or the NBA Playoffs. Betting lines are constantly updated to stay current with the various sports leagues. The wagering types available on Bovada’s sportsbook are similar to the ones you would find in Las Vegas. Point spread bets are amongst the most popular, where you can either bet on or against a certain score differential. There are also over/under bets, parlays, prop bets, future bets and more. Bovada offers Moneyline bets, or sometimes known as “American Odds”, where you can bet on a team to win outright as opposed to betting on a specific score line like you would with a point spread bet. Credit/Debit Cards—Bovada accepts either American Express, MasterCard or Visa. There is a minimum requirement of $50 and a maximum deposit amount of $1,000. A 4.9% processing fee is applied to deposits unless voided by a specific promotional offering at the time. Bitcoin—Bitcoin is Bovada’s preferred method and is the fastest way to both send and receive your money. You need to have a Bitcoin Wallet (unrelated to Bovada) before being able to send or receive Bitcoins. You can purchase them through your wallet provider or through online Bitcoin ATMs. There is a minimum deposit amount of $25 and a maximum of $1,000. No processing fees apply. Bitcoin—Bitcoin is the fastest and easiest way to receive your winnings. There is a minimum request amount of $20 and a maximum of $9,500. You can request withdrawals once per every 5 days. The window for your funds to be sent from your sportsbook account to your online Bitcoin wallet ranges from 1-15 minutes. No processing or transaction fees apply. Check By Courier—Bovada’s only other payout method is a check by courier. There is a minimum request amount of $50 and no maximum payout amount. You can request up to $3,000 once a week and the estimated time of delivery is 10-15 business days. Bovada’s customer service team can be reached in two ways. You can either call them at 1-888-263-0000 or send them a message through their messaging portal on the Contact Us page. For messages, just enter your name, email, department you wish to reach (General Customer Service, Bovada Casino, Bovada Sportsbook or Bovada Racebook) and enter your message. You should receive a response promptly. One of Bovada’s nice features is their mobile betting interface. You can access the sportsbooks’ mobile version by entering in the site’s URL in your mobile device’s browser window. There is no app download necessary. The mobile site uses responsive design technology to function the same as the web version across multiple devices and carriers. All of the same bonuses, security features, betting lines, wagering types and customer service are available on the mobile version. Live betting is one of the most exciting facets of sports gambling. Live betting gives you betting lines unique to the current match and they are offered on a strict time schedule—at some point the betting line will suspend. This creates more of a high-pressure situation as you watch the action unfold. You can access Bovada’s live betting on both their web and mobile interfaces. Are The Betting Odds At Bovada Comparable With The Odds From Vegas Bookmakers? Yes and no. Bovada’s betting lines are very similar to the ones offered in Vegas sportsbooks. However, in some cases, Bovada has more betting lines from different sports around the world that aren’t covered in Vegas. The odds themselves are also similar to the ones found in Vegas, so bettors shouldn’t feel any advantage or disadvantage in that regard. Is It Safe To Place Bets On Bovada? Yes. It is safe to place bets with Bovada’s online sportsbook. This brand is both legally sanctioned and regulated. There are over 200 million bets placed with their sportsbook annually. Their sophisticated security features keep your data protected and your overall online experience safe, including data encryption, firewall and anti-virus protection, and fraud prevention systems.